← Paul Ryan on US Immigration Reform: A Question of ‘When’? Senator Mark Daly and Fianna Fail Candidates in the Killarney Electoral Area are calling on the HSE to urgently arrange a meeting with public representatives in relation to the current ambulance provision system. Representatives from the HSE’s National Ambulance Service and senior HSE management met with GPs, public representatives and community groups in South Kerry on the 3rd of September 2013 to update them on plans to modernise the National Ambulance Service operations in the region. At that meeting the National Ambulance Service and senior HSE management gave a commitment that they would meet with all public representatives and review the effect of the reduced service on the people of Kerry with in 6 months however this has not happened. Senator Daly said “I would urgently ask for this meeting to be called, as a result of the disastrous consequence of the current ambulance provision system. The loss of the second emergency ambulance presents a danger to our community, who deserve rapid care during medical crisis”. The Fianna Fail candidates in the Killarney Electoral area Niall Kelleher, Councillor John Joe Culloty, Councillor Anne McEllistrum, John O’Shea are campaigning for the return of the second emergency ambulance to Killarney. To date they have distributed 20,000 leaflets informing the people of the area of the risk to lives caused by the loss of ambulance, with a further 30,000 leaflets due to be distributed in the coming weeks. 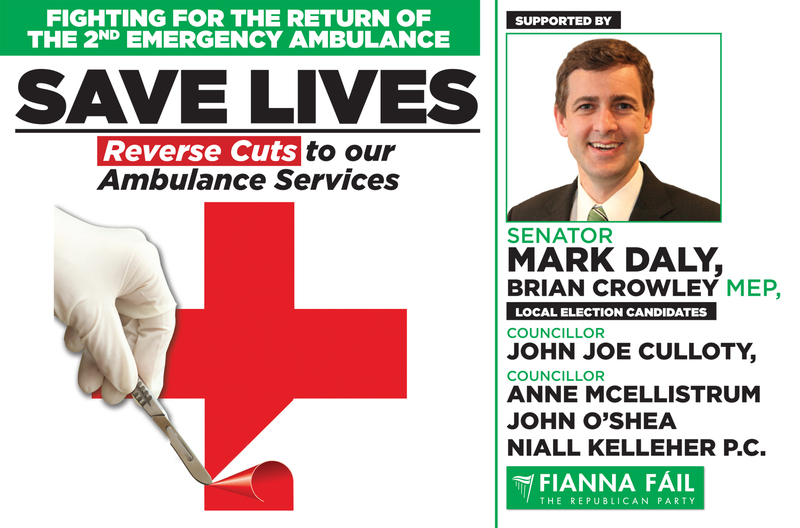 The reinstatement of the ambulance will be the centre of the local elections in the Killarney local election area.